Rising majestically among 7 acres of verdant landscape, Ozone Techno Park is conveniently located along Chennai’s IT Expressway – Rajiv Gandhi Salai, also known as the Old Mahabalipuram Road. Embraced by IT parks, residential and retail complexes, commercial establishments and banks, the district is buzzing with business activities. The latest amenities and Grade A infrastructure ensure that Ozone Techno Park will most certainly meet all the criteria for Blue Chip tenants, with the added advantages of scalability and sustainability. 9.5 lakhs sq.ft. 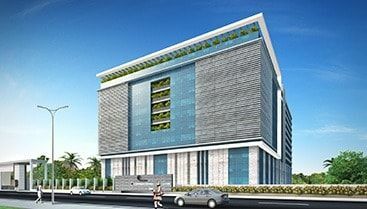 IT / ITES SEZ building spread across 7 acres. Large and efficient modular floor plates upto 96,000 sq.ft. • Parking at 1:1000 sq.ft. for the leased area.